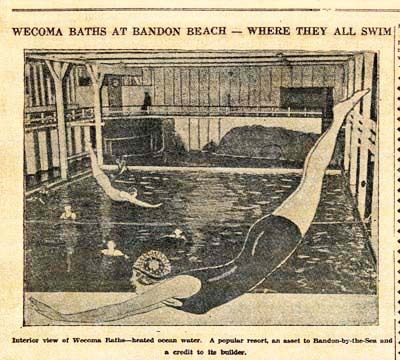 The completion of a heated, indoor swimming pool was a highly anticipated event in Bandon in the summer of 1925. Records found in the Bandon Historical Society Museum help chronicle the occasion. 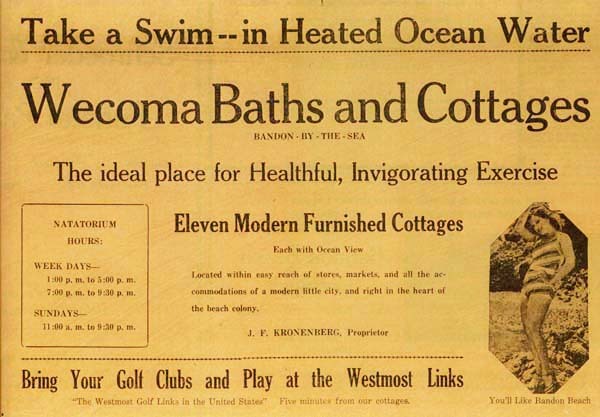 The Western World for June 4, 1925, led with the following: “Wecoma Baths, the new salt water natatorium on Bandon Beach, will be formally opened to the public next Sunday afternoon, beginning at 1 o’clock, according to announcements being made this week by J.F. Kronenberg who is just completing the interior work of the place. “The opening will be a formal occasion and it is expected that many visitors from other parts will be in attendance. Mayor S. N. Croft will deliver the address of welcome and the Bandon Concert Band will give a concert. There will be an exhibition of diving and fancy swimming and other attractions to add to the festivities. “The natatorium building is 110 feet in length and 65 feet wide, while the tank is 40 X 80 feet with 9.9 feet depth at the deep end. The floor slopes from this depth to 18 inches. Fifty dressing rooms will be ready for Sunday. It is to have private tub baths and showers but this part of the equipment will not be installed until later. The spectators balcony extending along the south and west side above the tank will afford seating accommodation for about 150 people. “The tank is filled with filtered seawater raised to a temperature of about 74 degrees. It is on a circulating system which means that the water is constantly changing, keeping it clean and sanitary. The baths drew seawater through an intake pipe anchored in the offshore rocks and pumped it up the bluff. A conveyor hauled driftwood off the beach to fuel the boiler. The paper gave an account of the mayor’s address and the performance by the Bandon Concert Band. The Western World account continued: “Dr. S. C. Endicott, acting as chairman for the afternoon, called attention to the fact not generally known that there was a sentimental reason as well as a material one in the mind of Mr. Kronenberg in building the natatorium. “A number of years ago Mr. Kronenberg’s brother was accidentally drowned in the Coquille river because he was unable to swim. The thought that his life might have been saved had the young man enjoyed an opportunity to learn to swim before the day of his fatal accident, prompted Mr. Kronenberg to build as a suitable memorial a place where all the boys and girls as well as the older people of the community might have such an opportunity. The historical society’s obituary files fill in the story. Harry Kronenberg, a 19-year-old attending college in California, returned to Bandon for the summer. 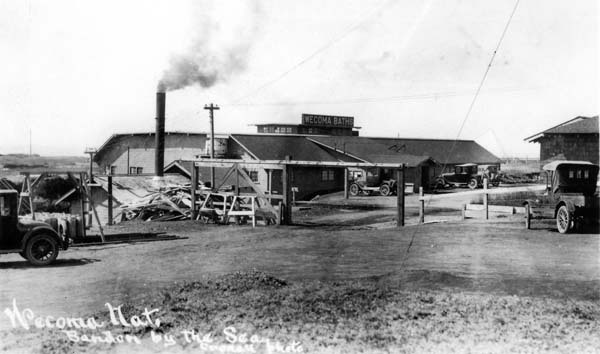 He was at work moving logs to a mill when he drowned in the Coquille River in 1908. 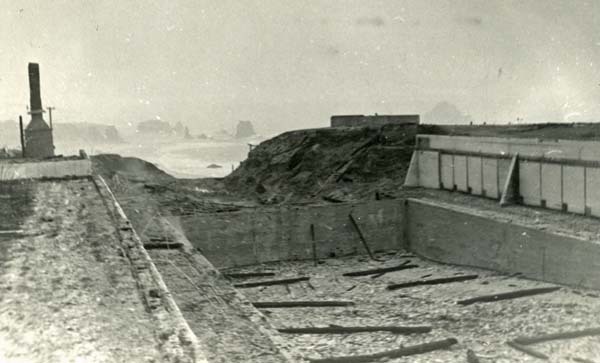 The Wecoma Baths were located on Coquille Point at the west end of 11th Street. A private business venture, the natatorium was part of a resort complex that included ocean view cabins and the Silver Spray dancehall. 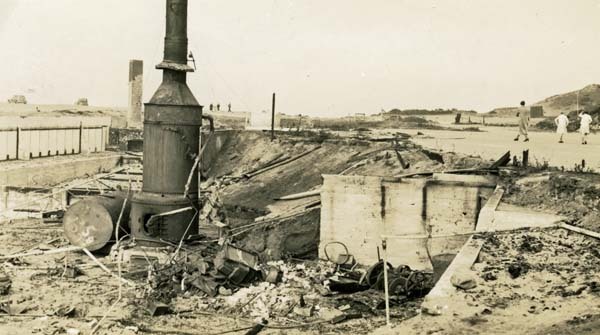 The facility was destroyed in the 1936 fire. Skateboarders skated in the remains of the pool into the early 1980s. The last traces of the pool disappeared when the headland was developed into a national wildlife refuge. An interpretive sign with a picture of the Wecoma Baths stands near its former site on Coquille Point. 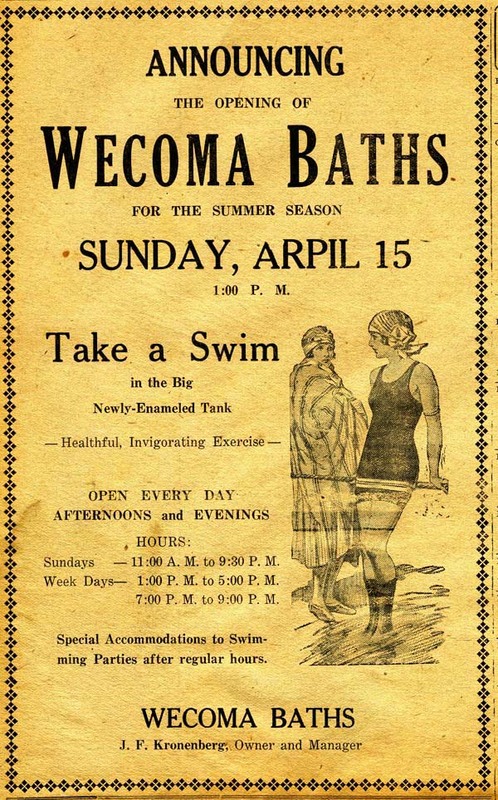 The poem below was part of the full-page advertisement for the opening weekend of the Wecoma baths. In every patch and wrinkle. If you are burnt or freezing. And eat hot buns and wieners. With scarcely life to cackle. Or spoil your taste for leisure. *Cook and Peary, polar explorers, were familiar to the readers in the 1920s.